Our intern, Sara MacIntosh, shares her tips for creating a digital content calendar. Engaging your audiences online is one part art, one part consistent effort. If you’re responsible for your organization’s social media, the need for content may feel like it’s never ending. Keeping up is challenging, but a content calendar can help you take a strategic approach to both storytelling and time management. A content calendar (AKA an editorial calendar) is simply an outline that lists your social media channels and plots out content opportunities over a given time period. It typically includes post copy, relevant links, and an indication of the images and video you’ll use. At a glance, you’ll be able to see what is to be posted and when, making gaps or overlapping content easy to spot. 1. Start with a solid understanding of your audiences. Which of your social media channels reach which of your audiences? And what kind of content is the audience interested in? Not all of your content will be appropriate for every channel. 2. Determine the calendar range and set a frequency. Identify the amount of time you are working with. Are you planning for week? A month? Working month-to-month is often a good place to start. You get the benefits of planning ahead without the information gaps that might exist with longer range planning. Frequency is important to consider – some organizations will post multiple times a day, while for others a few times per week will be sufficient. Either way, if you set an explicit frequency goal, you are more likely to achieve it. 3. Identify the stories you want to tell. What does your organization have to say? Are you making announcements, launching new products? What insights can your leadership team offer on your industry? When you don’t have internal stories to share are there universal topics that you can tag onto (eg: holidays, larger news stories)? 4. Words + visuals = content. The words you use to tell the story are important, but no social media post is complete without an image or a video. Write posts and source images ahead of time where appropriate. Whenever possible, include a call to action in the post. 5. Pre-schedule your posts. Social media management tools like Hootsuite are a community manager’s best friend. They allow you to pre-schedule posts, helping reduce the pressure of posting on the fly. Having said that, it’s important leave some room in your social media plan for spontaneity. The real social media magic happens through genuine conversation with your audiences – and that can’t be scheduled! Elettra Communications provides social media strategy and content development services. We build content calendars for all platforms. Contact us at info@elettra.ca. A celebratory event is a great way to show your employees how much you value them. It’s also an investment in engagement and culture building, so it makes sense to spend your resources (including time and budget) wisely by making thoughtful event planning decisions. 1) Let your guests be your guide. Start your event planning by mapping out everything you know about your guests. From this, create a guest profile to guide the planning process. Check your all decision against that profile. This includes everything from your venue location (is it convenient and easy for your guests to get to? ), to the food and beverages you’ll serve (have you considered a variety of dietary needs?). At YVR Stars, the nature our guest list – which included shift workers, 9-5 office workers, and volunteers – shaped the event. We chose a time that made sense for all workers and ensured it was drop-in style so that shift workers could stop by on a break. We even created plan for getting the invitation to guests who don’t work at a desk and therefore might not be able to receive an invitation via company email. Have you ever been to an event that was billed as a celebration, but somehow just felt flat? Well, the truth is, mood doesn’t create itself. Oftentimes lighting gets overlooked or even cut out entirely due to budget, but it really is critical for setting the tone. House lighting will never deliver on a party atmosphere, but proper lighting design adds drama, sparkle, and even the opportunity to brand the event through use of coloured lighting. You might not think about the connection between food and mood, but have you ever been standing at an event for 30 minutes before a server finally appears with a tray, but then can’t even make it ten steps from back-of-house before his/her tray is empty? A hungry guest is one that doesn’t feel valued. When planning an occasion, collaboration with your caterer doesn’t stop at selecting a menu. Work with them to ensure that the food is tasty (you can even ask to do an advanced tasting), plentiful, and ready to go the moment your first guest walks through the door. Of course setting the mood doesn’t stop there. Décor and entertainment are also important. Don’t just hire a DJ, actually work with her/him to develop a playlist that suits your guest profile. For YVR Stars we injected some fun with a Tap Snap photo booth. Décor-wise, you can see from the photos what some colour can do. 3) Say it out loud. Though treating your guests to food and drink is a great start, showing your appreciation is about saying it out loud. In the case of YVR Stars we accomplished this through an awards show presentation. The program provided an opportunity to share and celebrate the stories of workers who went to great lengths in the name of customer care. This was backed up with a thoughtful gift in recognition of their efforts. We also spread the love around the room, incorporating reflections on everyone’s efforts and gave away many stellar door prizes that were a fit for our guest profile. 4) Bring in the experts. Creating a successful event is not about ticking off a to-do list. It takes strategic vision, technical know-how, strong supplier relationships, and, most importantly, time. If your company could benefit from this assistance, then it’s a good idea to call in an expert. Look for an experienced event planner, someone who views challenges as an opportunity for creativity. A good planner will act as your partner, providing smart counsel and making sure every last detail is considered. Together you’ll make event magic happen. Contact us for a complimentary one-hour brainstorming session at info@elettra.ca. Next up in our book club is Steven Fink’s Crisis Communications: The Definitive Guide to Managing The Message - a follow up to Crisis Management: Planning for the Inevitable. Fink is well positioned to be an authority on the subject of crisis management and crisis communications having dealt with more than his fair share of difficult situations on behalf of clients. He has provided counsel for some of the world's most prestigious companies in crisis management and crisis communications, strategic public relations, corporate communications, and high level, confidential issues relating to economic espionage. Whereas Crisis Management deals primarily with the reality of the unfolding crisis and how to manage it, Crisis Communications focuses on the perception of the event and, most especially, the perception of how it is being managed. The book doesn’t make any groundbreaking revelations on the dos and don’ts of developing a crisis communications strategy, however, what makes it an entertaining and enjoyable read are the real life examples of well known companies who have hit the mark in their crisis communications…or missed it completely. The book contains detailed analysis of recent high profile catastrophes such as the BP oil spill in the Gulf of Mexico, the crisis at Pennsylvania State University in 2011, and the unintended acceleration glitch that rocked Toyota in 2010. Fink uses these examples to reinforce the importance of being prepared and having a carefully thought out crisis communications strategy in place. These case studies also highlight many examples of what not to do should your company find itself at the centre of media circus. Here are a couple of key takeaways from the book….and if you’d like to know more about crisis communications for your organization then please give us a shout! Throughout the book Fink comes back to this one single point. It doesn’t matter if your company has not done anything wrong, if it is perceived otherwise in the court of public opinion, then that perception is what people will remember. And that perception may ultimately affect your business and the value of your brand. If a crisis is being managed well, the goal of effective crisis management is to form the public’s perception to match the reality. In the end, crisis communications, or the lack thereof, is all the public remembers. Things are chaotic enough during a crisis that you need every advantage you can muster. It is therefore a good idea to take stock of how your company is perceived on a normal day. Are you considered trustworthy? Are you communicative with your publics? If there is something you need to address then do it now. It is important that your publics think good things about you before crisis hits. This is what Fink calls “reservoirs of goodwill”. This winter we’re cozying up with a few books. And if they’re good reads, we’re going to tell you about them. We're starting with Finders & Keepers, by Spring Advertising Creative Director, Rob Schlyecher. In Finders & Keepers, Schlyecher tells us that the demographic information - age, gender, education, etc. - that marketers have long relied on to make decisions actually reveals very little about how consumers spend money. Demographic info comes up short because it does nothing to explain how a consumer feels. There is a better way, according to the author, to understand consumers' purchasing decisions. Based on extensive research done in Australia the findings of which were tested in real estate market in the US, Schlyecher identifies two groups called, not surprisingly, Finder and Keepers. (There are actually three if you count the Finder’s upstart cousin, the Evolving Finder). Finders value discovery and the time spent in, well, finding. When it comes to a product or company, they like information - they want to know about the provenance of a product and the story of how it was crafted. They value design, innovation, and authenticity. They love sharing the story of their discovery. Price is only a piece of information for the Finder, it’s not the deciding factor for their purchase. And in fact, they may be downright distrustful of a discount. Keepers, in contrast, are very price sensitive. They like a deal, but they don’t want to spend a lot of time getting it. They value brand highly, especially as it relates to status and established trust in the product they know. They are not particularly adventurous. How does this work in practice? As just one of many examples, Schlyecher suggests a true Finder who is a chocolate lover would make the extra effort to visit the Thomas Haas Patisserie (a bastion of authenticity and craftsmanship if ever there was one) in an out-of-the-way industrial park tucked behind an automall in North Vancouver. We suppose a Keeper with a chocolate craving would probably be pretty happy picking up whatever's on sale in the grocery aisle. Schlyecher argues that, for several reasons including Finders not being price sensitive, companies that appeal to Finders can be recession proof. But for those companies going after Keepers based on pricing tactics, it’s ultimately a death spiral (the book offers up the poignant example of Circuit City) - that is, unless you’re Walmart, of course. Granted, this is a massive oversimplification of Schlyecher’s thesis, but for the in-depth goods on Finders & Keepers (and how it could apply to your own company), we suggest you pick up a copy of the book. It’s a great read. As a public relations agency, the concept of Finders and Keepers bears thinking about. After all, PR is all about telling a story. And it works best when that story is about innovation, quality, service, and experience. In fact, PR is downright ineffectual if it’s trying to tell a lowest price story. It would seem that PR is made for Finder companies. We’ll certainly be giving the Finders and Keepers philosophy considered thought in the future. The critical first step in planning a gala is selecting the right venue. To help take anxiety out of venue choice, here are some tips from Elettra’s event team. Traditional venues include hotels, conference centres, and restaurants. A non-traditional venue can be anywhere, really – a farmhouse, an airplane hangar, or an outdoor plaza to name just a few. The appeal of non-traditional venues is obvious – they tend to be more interesting, creative, and unexpected than the (often) beige four walls of a hotel ballroom. Start by asking yourself if this element of surprise is important to your organization and your guests. While the cost of hosting at a hotel or conference centre may seem high at first glance, remember that a non-traditional venue is usually a blank slate. That means you’ll need to consider the cost of bringing every single spoon, glass, and chair to the event site. Not to mention the audio-visual and décor required to make the space come alive and the extra event planning and labour hours required to pull it all together. But when it comes together…wow, you can truly blow your guests away! Elettra worked with the BC Aviation Council (BCAC) on their Silver Wings Awards. For their 20th anniversary they didn’t want the typical hotel ballroom, so we turned YVR’s South Terminal into a gala awards show venue, complete with staging, AV, and a dinner buffet. It was so worth the time and effort to create something unexpected for BCAC’s guests. A half-full room, no matter its size, suggests that an event is not a success. Before booking your venue, do some serious thinking about how many people will attend. Is your invite list 500? Consider realistically how many people will come at the ticket price point you are setting. Hotel and conference spaces offer a bit more flexibility on room size as ballrooms often have air walls that can divide up the space. This means you can often make adjustments to your venue footprint once you have a sense of how ticket sales are going. In a pinch you can also use pipe and drape to section off a space, but this isn’t ideal and it’s much better to choose the right size of space in the first place. How easy is your event to get to? The answer to that question has a direct bearing on RSVP numbers. Is your event in the downtown core and starting right after work? Great. Have you chosen a far-flung spot that’s not easy to get to via transit? No problem, but you’ll need to budget for shuttles or taxi vouchers to facilitate guest transport. Oftentimes hosts treat décor as a “nice to have,” but it’s every bit as critical to the event’s success as food and drink. A good event manager will insist that this is part of the plan. When choosing your venue, consider what it will take to create the desired atmosphere for your guests. If you choose a beautiful spot like Vancouver Art Gallery’s Rotunda, it might not take much more than a bit of lighting and some florals, but if you choose a windowless ballroom or a warehouse, be prepared to devote some serious budget and effort to creating an atmosphere worthy of your event. Have an event you need help planning? Contact Gwen or Simone at Elettra Communications. We have a combined 30 years' experience in creating successful events of all shapes and sizes. It's an exciting time in downtown Vancouver. For the past three years, Pacific Centre at Granville and Robson - the city's busiest shopping, working, and entertainment precinct - has been undergoing a dramatic transformation. The first phase of the Pacific Centre redevelopment is now complete with the opening of the office space at 725 Granville Street. Sony Pictures Imageworks have now officially moved in. Retail tenants in the mall space will begin to open this summer, and the Nordstrom opens with a bang in September. 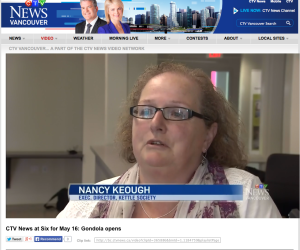 Check out the Vancouver Sun's story today about the completion of the 725 Granville office space. Cadillac Fairview has opened the doors to its new AAA class office space at 725 Granville Street and the first tenant - Sony Pictures Imageworks – has moved in. Part of the redevelopment of the former Eatons/Sears building 725 Granville offers four floors of office space above Nordstrom’s future Vancouver location. Each floor has 17-foot ceilings, slab to slab, and offers 73,000 square foot floor plates, a unique feature not currently available in the downtown core. Sony Pictures Imageworks will occupy a whole level of office space on the 5th floor of the building. Microsoft will join Sony at 725 Granville later this year when they move in to their offices on the 6th and 7th floors. Law firm Miller Thomson will take occupancy of 48,000 square feet of office space on the 4th floor in early 2017. Daylight Saving Time is this weekend, wand the switch often comes with negative side affects for the population including headaches, lost productivity, and a spike in traffic accidents. What many don’t realize is the profound effect that the time change has on Alzheimer’s and dementia sufferers, for whom a regular schedule is critical to quality of life. Coreena Robertson, Communications and Wellness Director at Fraserview Care Lodge and creator of Boomerang LIFE products, gave an interview with Richmond Review (see here) on how the time change affects seniors with Alzheimer's or dementia. The time change causes confusion and can increase behaviours known as “sundowning,” which includes acting out, general aggression, a tendency to wander away, and increased feelings of depression and anxiety. Make the transition gradual. The sudden loss of a full hour is difficult to cope with. To address this, on the first day of Daylight Saving Time, allow your loved one to sleep for 45 minutes past their usual wake up time. On subsequent days, gradually move wake up time ahead by 15-minute intervals until the desired wake-up time is reached. Engage with your loved one. Take extra time to engage your loved one in the days following the time change. This is especially important around meal times, when what their body is telling them may not match what the clock says. Turn on their favourite TV show or play a game to help focus their attention. Relax into sleep. As the name suggests, “sundowning” happens in the early evening. To keep sundowning behaviour at bay, choose an activity to engage them with, but make it something calming such as listening to soft music and or sipping a warm beverage together. This will also help your loved one prepare for going to bed an hour earlier than usual. Be present. Meet your loved one in the moment they are experiencing, everyday. Join them in their journey by validating what they are saying. Don’t try to correct their ‘stories’. 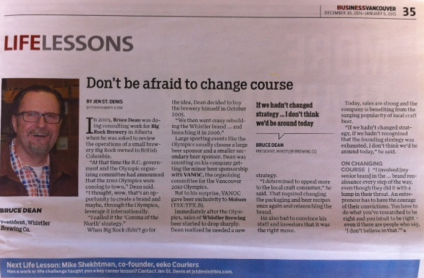 Whistler Brewing Company president Bruce Dean was featured in Business in Vancouver’s Life Lessons column over the Christmas holidays. Whistler Brewing Company celebrated its’ 25th anniversary at the end of last year and the article gives a valuable insight into the evolution of the brand and the importance of adapting to changing situations and taking calculated risks. The Kettle Society, Harbour Centre, and the Vancouver Lookout are inviting Vancouverites to celebrate the season with a twist this year. Instead of photos with Santa, they are offering people a chance to get ‘Snow Globed’. Visitors to Harbour Centre’s lobby can have a photo taken inside a giant snow globe with their own camera or phone between now and December 20th. A sneak peek was held on Friday, November 28 when participants were given the opportunity to have their photo taken with the Whitecaps FC president Bob Lendarduzzi, club ambassador Carl Valentine, and mascot Spike. The Snow Globe will be open Mon-Fri and on two Saturdays, Nov 29th and Dec. 6th. Whistler Brewing Company celebrated its 25th Anniversary on Saturday evening at the Longhorn in Whistler with a special customized cask competition. Earlier this month six BC personalities tapped into their inner brewmaster to create a customized cask of ‘anniversary ale’ by developing their own recipes using a Whistler Brewing base beer and selecting their own combination of hops and other ingredients. The contestants tapped their casks and their special brews were judged at the company’s anniversary party this weekend by a judging panel including representatives from BC Craft Brewers Guild, Whistler Blackcomb Food and Beverage, Whistler FM and headed by Whistler Brewing Company president Bruce Dean. James Walt’s “The Missing German” brew was announced the winner and was awarded a special 25th Anniversary trophy. Sean Pettit came second with his “The Root Beer”. We are delighted to be working with alumni UBC to publicize Fashioning Cancer, a fundraiser in support of the Canadian Cancer Society Cancer Prevention Centre at UBC. The event, part of Western Living Design Week, will feature the auction of ten exquisite evening gowns that were designed as works of art by Jacqueline Firkins, Assistant Professor, UBC Department of Theatre and Film, to encourage honest and open conversations about cancer. The gowns were inspired by colourful microscopic images of cancer cells and cellular systems and auction and ticket proceeds from the event will go to the Canadian Cancer Society Cancer Prevention Centre at UBC. In addition to the auction there will be a live performance by Canada’s queen of punk, singer/songwriter and cancer survivor, Bif Naked. For further information and to buy tickets, visit www.alumni.ubc.ca/fashion. Local company Mahony & Sons opened the doors to their newest location in South False Creek earlier this week and Vancouverites have been flocking to the new restaurant to check out the detailed authentic Irish décor and sample delicious dishes and drinks on the stunning waterfront patio. Prior to the opening Breakfast Television’s Dawn Chubai came down to Mahony & Sons to broadcast four cooking segments with Executive Chef Paul Nguyen and the Mahony brothers. Viewers learned how to make Mahi Mahi Fish Tacos (a Mahony & Sons best-seller), Lily Belle’s Shrimp Salad, and Lee’s Lamb Dip, and Bar Manager Barry Quinn gave some useful tips on how to pour the perfect pint of Guinness. The opening of Mahony & Sons Stamps Landing has proved of great interest to the local media and food bloggers with rave reviews appearing on the Georgia Straight website, Vancity Buzz, Modern Mix, and My VanCity (to name just a few), as well as on the websites of national food trade publications such as Canadian Restaurant News and Foodservice and Hospitality. Follow @MahonyAndSons on Twitter for details on further coverage in the coming days and weeks. The craic was mighty on Thursday evening as Mahony & Sons hosted a special sneak preview for media of their much-anticipated Stamps Landing restaurant. The family-run company has just completed a complete overhaul of the former Monk McQueen’s site in South False Creek and will be officially opening the new 10,000 square foot location on Monday, August 18 at 11am. Guests at last night’s media event were invited to experience true Irish hospitality and enjoyed the perfect pairing of Guinness and oysters upon arrival, followed by a tour of the new premises before sampling a number of signature Mahony & Sons dishes prepared by Executive Chef Paul Nguyen. Mahony & Sons Stamps Landing can seat up to 600 people spread across two levels - 150 upstairs, 150 downstairs, and 300 on the four waterfront patios. Key features include an Oyster Bar, an extensive patio with double-sided fireplace, and a private sunset patio perfect for small groups. Thank you to all media who attended – Mahony & Sons appreciates your support! 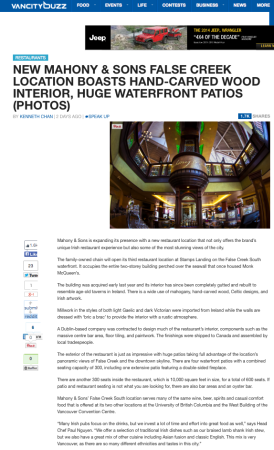 Elettra’s clients Mahony & Sons are featured in Malcolm Parry’s column in today’s Vancouver Sun. The article touches on the family’s extensive history in the hospitality trade and reveals some of the exciting features to be enjoyed at the fantastic new location at Stamp's Landing when it opens next month. Click here to have a gander. On Monday, June 16, 2014 the Vancouver Police Foundation launched its Kops’ Shades for Kids Campaign. Back by popular demand, the campaign connects the public to the police via iconic, mirrored aviator sunglasses - a signature look inherently tied to police. Introduced last summer, the campaign raises funds for Vancouver Police crime prevention projects and early intervention community outreach programs. It also seeks to strengthen the link between the Vancouver Police Department (VPD) and the community it serves. The launch event was held at the corner of Granville and Georgia. There were four cameras and two reporters who attended, along with many people walking by who stopped to see what was happening. This was a hard to miss event, because right on the side of the street were two large police horses, a police dog and his trainer nearby. There was also music and free popcorn courtesy of Jack FM. Policemen and policewomen were available to answer questions from anyone who wanted to chat. This event brought in a crowd of people, and it was a great opportunity to share with the public what the Vancouver Police Department and the Vancouver Police foundation do. Great program for a great cause. Click here if you are interested in learning more, or buying your own pair of shades. Elettra Communications attended a special Gala event at the weekend at The Kettle Society’s new supported-housing building located at 1134 Burrard Street. The Kettle Making a Difference – An Evening with Olympian Clara Hughes and Friends, was a special fundraising event to raise funds for The Kettle Society’s community mental health programs and celebrate Clara’s inspiring 12,000km bike ride across Canada to build awareness and eliminate the stigma surrounding mental health. The Kettle had been chosen as Vancouver’s “community champion” for the ride. Kari Adams from CTV emceed the event and CTV broadcast live weather forecasts and interviews from the VIP reception. Speakers included: Deputy Mayor Adriane Carr; Debra McPherson, President of the BC Nurses Union; Daniel Boffo from Boffo Properties; Mary Deacon, Chair of Bell Let’s Talk; Brenda Lea Brown, Chair of the Kettle board; and Kettle member Denis Piper. Six-time Olympian Clara Hughes took time out of her grueling and physically challenging schedule to address guests and VIPs and deliver an emotional and inspiring keynote speech which touched on her own experiences with mental illness. The Kettle Society was busy last week as it welcomed media to its newest supported housing project, before its first tenants move in. CTV, The Globe & Mail,The Georgia Straight and BCIT all featured articles about the building. The Kettle Society also hosted An Evening With Olympian Clara Hughes & Friends on Saturday, May 17 at Kettle on Burrard. The event was attended by more than 200 guests and VIPs and featured a keynote address by the six-time Olympian, who is cycling across Canada to build awareness and raise funds for mental health. Located at 1134 Burrard Street, this new building is one of 14 City-owned sites that are being built to end street homelessness. The building has been designed to address the needs of individuals who are homeless, are at risk of homelessness, have mental health issues, or require other support services to increase their wellness and overall quality of life. Kettle on Burrard has 141 suites and 24-hour staffing and security. The building is operated by The Kettle Society, a non-profit registered charity, which has been providing housing and support services to people with mental illness in the Metro Vancouver area since its inception in 1976. The project is being funded by the Province of BC (BC Housing and Ministry of Children and Family Services), the City of Vancouver, and Streetohome Foundation. Pacific Centre has made the top-10 list of “most-productive” shopping malls in North America, meaning they have among the highest sales per square foot on the continent. The 2013 list, compiled by Retail Insider, pegged Pacific Centre at No. 4, with $1,335 sales per square foot. Check out the full article and list via The Province.